The map has a 250ms fade duration. And scenes are opened after all elements are fade out. And enabled the fps to see, if this is a performance issue or just a delay. Last edited by OSean980 : 06/26/16 at 01:49 PM. Installed your addon list. Scary to run so few addons, but no performance issue. Please show me a video. Had the video on standby before you'd posted, so I forgot to include the ingame fps counter. Sorry! Shadowplay marked a consistent 60 fps though, and right now the ingame counter is staying above 70 while I'm testing it. If it is important, I can take another quick one with the ingame fps counter. It's easiest to notice the delay in the UI if you watch the crosshair or other parts of the UI. On the minimap one, the crosshair disappears well before any UI window opens. But on the one with no minimap, they're almost simultaneous. It's most noticeable at the end with the dialogue and loot windows, but the escape menu is a good representation too. Last edited by OSean980 : 06/26/16 at 01:26 PM. Last edited by votan : 06/26/16 at 12:26 PM. EDIT: I'm trying to see where the minimap is starting from before it jumps, and it looks like it's at max zoom level of the zone without pins first, then zooms to the player and adds pins simultaneously. 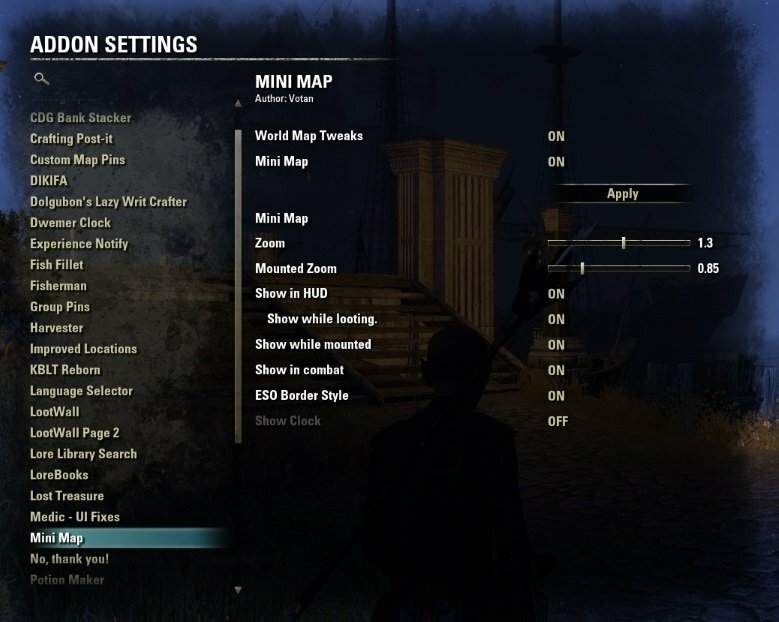 I don't have any experience with the ZOS API, but maybe some map functions being used in the minimap have performance issues? The game might be having a hard time trying to recreate the map each time a new UI window is opened, if I'm understanding how the minimap is functioning based on what I've observed. Are you using "Destinations". Could you disable it for testing, please? If not, can you show me a list of your addons? First I will install all your addons. Last edited by OSean980 : 06/26/16 at 10:14 AM. Hi votan, many thanks for the addon. Would it be possible to let us zoom the map by keybinds though (if we want it to show more or less of the map, e.g. inside dungeons)? And I'd like to 2nd the requests of Phnix to be able to change the size (width, height) of the minimap and change the pin size. many thanks again for this performance friendly minimap. Oh yeh sry theyre is a setting for zoom, still I prefer zoom from scroll if that is possible. By enablling this you get a zoom and pan performance havok. Believe me. Nothing kills the (World) map more than reachoring dozents of pins while doing the nice zoom animation. I had to pinpoint the zoom level to one value. I'm already working on more options. Less funny as one thinks. Sizing pins does not work, as it would required to reset size on opening the world map. Otherwise the pins are un-clickable. Not a simple "I just add a multiplier". Currently I'm working a border style options. Which is "uncritical". But even here you have a lot control setup code for .... appearance. Anyone out there, which can test/confirm "Destinations" causes performance issues of OSean980? Last edited by votan : 06/26/16 at 08:37 AM. Last edited by Baertram : 06/26/16 at 07:57 AM. Any chance you can add zoom from scrolling and being able to set a default zoom level in options? But there is a zoom slider for mini map already??? What do you mean? Last edited by votan : 06/26/16 at 02:50 AM. Last edited by votan : 06/26/16 at 01:36 AM. And what if you disable the tweaks? The pin categories are the defaults (Objectives, Wayshrines, Group Members) plus Garkin's Skyshards (Unknown Skyshards enabled, Collected Skyshards disabled). 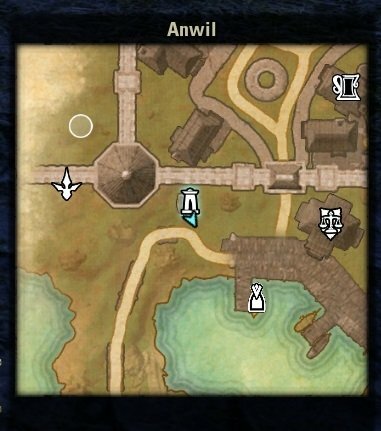 Disabling World Map Tweaks with Minimap enabled still slows the UI. Disabling the Minimap with World Map Tweaks enabled fixes the slow UI. The problem seems to be with the minimap. EDIT: I disabled Show in HUD while leaving the minimap on so the minimap wouldn't show in any scenes, and the UI returned to normal speed. Seems to be related to displaying the minimap. If I had to throw out an uneducated guess as to what's happening, it might have something to do with why the minimap and worldmap are jumping locations when they're opened. 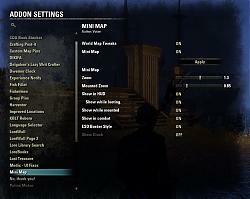 The time it takes to open the escape menu or any other menu is about the same time it takes for the minimap or worldmap to jump from whatever position it thinks it should start at to the player's position. Last edited by OSean980 : 06/25/16 at 04:15 PM. Having the same problem with pins filtered out? Do you have mini map visible at loot window? Not using HarvestMap. Also not using any other addons that modify the map. I turned this addon off and on to compare the difference and whatever is making the UI slower is definitely coming from the minimap. I'm tracking the memory usage using your Settings Menu addon and I'm allowing sufficient extra memory space. Addons are using 40 of the allotted 64 MB (I also tried to bump it up to 128 max with no difference), so I don't think this could be a memory problem. Last edited by votan : 06/25/16 at 03:47 PM.